Part 3 of Hollywood Gothique's 2012 Halloween Haunt Odyssey returns to a land we visit every October: Woodland Hills, with stops in Tarzana and Encino along the way. Since we have reviewed most of these yard haunts before, we will not delve deeply into details here; instead we will note what new tricks and treats are on view, so that you can decide whether your old favorites deserve a return visit this season. THE HOUSE AT HAUNTED HILL is up to its old tricks, but they're good tricks - worth seeing again and again. For Halloween 2012, the essentials remains the same (telling a story through narration, music, and dialogue) but some of the props and effects have been rearranged, and a few new treats have been added. There are more flickering candle lights on the roof, illuminating a Jack-O'Lantern. The diaphanous phantom in the upper story window looks much more insubtantial, and we noticed the shadow of a skeleton walking across the garage door. (The latter is apparently not new, but the timing has been changed to make it easier to notice.) 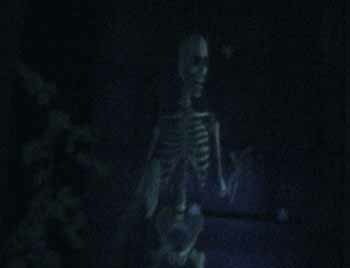 A phantom skeleton materializes inside a tomb, waving a weapon. However, the most obvious addition is one that takes place between shows. 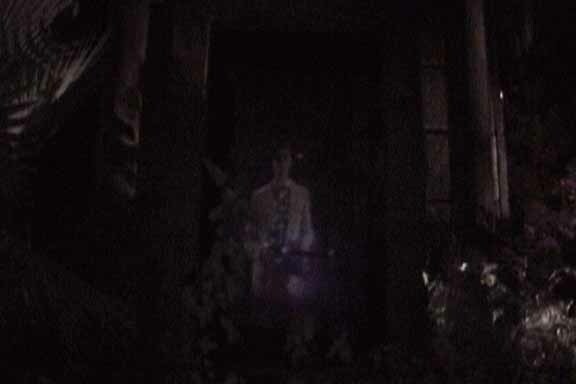 During the downtime, audiences waiting for the next performance are greeted by a ghostly reporter, who either appears in a tomb or pops up before a gravestone, snapping pictures and delivering one-liners related to the haunt's sordid Hollywood back story ("You know what they say: married twice, murdered once"). The reporter is played by actor Neil Patrick Harris, who is apparently a big Halloween fan, having also produced Delusion 2012: The Blood Rite. 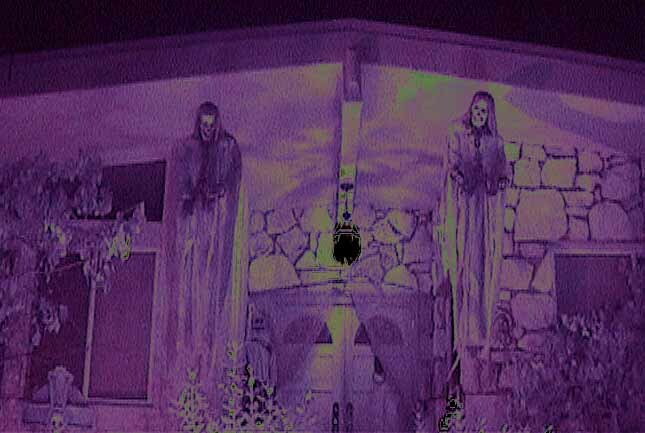 Open from 7:00pm to 10:00pm on Halloween Night, The House at Haunted Hill is located at 4400 Saltillo Street, Woodland Hills, CA. Admission and parking are free, but the street is blocked off to cars for the safety of foot traffic, so be prepared to walk up that haunted hill! FALLEN ANGEL CEMETERY is also in Woodland Hills, perhaps a fifteen-minute drive from House at Haunted Hills. This is a much more low-key, small scale haunt - basically, a decorated yard, enhanced with well-timed lightening and thunder effects. The small yard is packed with tombstones and skeletons, which affect a classic Halloween tone, emphasizing spookiness rather than shocks. Parked out front is a hearse with a skeletal bride in back and Lon Chaney's The Phantom of the Opera in the driver's seat (a mannequin, not an actor). Fallen Angel Cemetery is suitable for young trick-or-treaters. It is really a neighborhood attraction - not worth a long trip all on its own, but if you are in Woodland Hills to see The House at Haunted Hill and/or the Forest of Mirrors, this yard haunt is certainly worth a brief detour. The address is 23830 Berdon Street Woodland Hills, CA 91367. Candy will be given out on Halloween Night from dusk till 10:00pm. 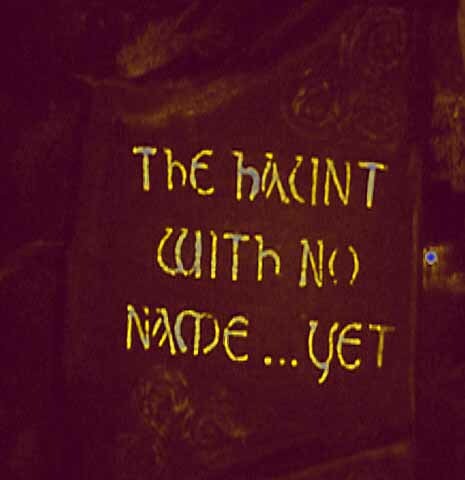 THE HAUNT WITH NO NAME YET remains as subtle and spooky as ever. Eschewing scare actors and flashy effects, this yard haunt comes closest to resurrecting the mood of the Hallowed Haunting Grounds (which last manifested in 2005). This Halloween, The Haunt with No Name gleefully embraces its nameless status, with a new sign out front and a Mannequin Medium. 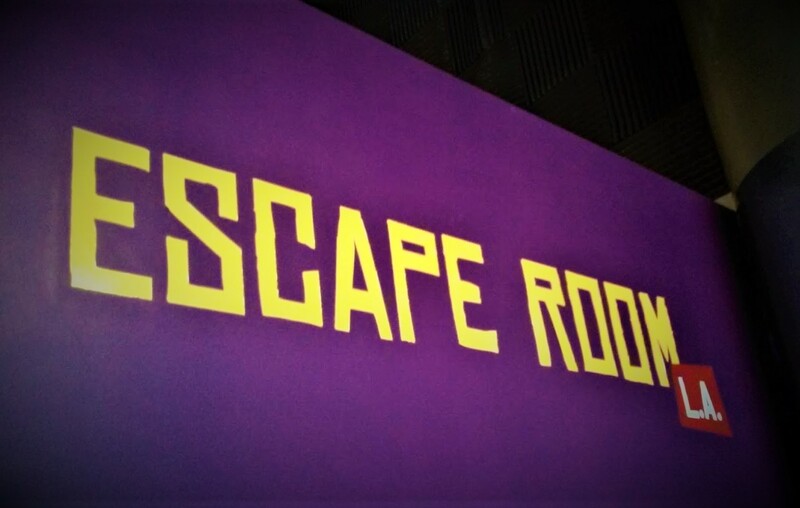 The sign presents a nifty optical illusion: the letters are cut out of the front surface, with light shining through from within, but the letters are so thin that it confuses your parallax vision (the difference between what you left eye sees and what your right eye sees), creating a sense that you can't quite focus on the letters. The Medium periodically awakens to deliver an invocation, specifically referring to the surrounding spooky territory as "This Nameless Place." The accompanying narration does a fine job of providing a poetic impression, if not an outright back story, that unifies the various supernatural manifestations on view. 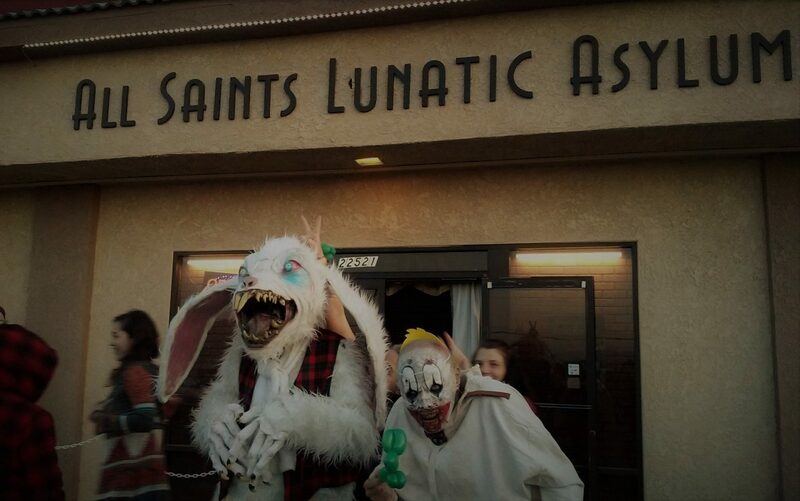 The Haunt with No Name Yet can be found at 19351 Hatteras Street Tarzana, CA, from dusk to 10pm on Halloween Night. The haunt's webiste is here. SPOOKY HOLLOW offers a small yard with fog and lights, haunted by a handful of animatronic figures: a knife-wield ghoul emerges from a barrel; an emaciated monsters pops out of a toxic waste bin; a creepy corpse lifts the tombstone behind which he has been hiding. Our impression was one of good Halloween fun, with nothing too terrifying for trick-or-treaters. The proprietor tells us that, on Halloween Night, Spooky Hollow will be haunted by costumed characters, but their goal will be to greet visitors and hand out candy, not to scare anyone away. 2012 is Spooky Hollow's first Halloween; if all goes well, it could become an annual - and gradually more elaborate - tradition. As with Fallen Angel Cemetery, we would not recommend making a special trip just to see Spooky Hollow, but it is worth a drive-by on your way to Tarzana and/or Woodland Hills. The address is 17449 Burbank Boulevard, Encino CA. This is a rather busy street, so you might have better luck finding parking around the corner on Encino Avenue. The yard will be haunted from 7:00pm to 10:00pm on Halloween Night.